Sharing How I Make The Best Creamy Stovetop Oatmeal made with gluten-free and dairy-free ingredients and they have extra protein in them! You can find me eating a bowl of warm oats anytime of the year but especially in the dead of winter. There is something so comforting and cozy about having oats during the day. Sure they are a breakfast classic but I sometimes make oatmeal for lunch or a snack during the day. It took me years of making oatmeal and trying different variations to finally perfect how to make the best creamy stovetop oatmeal. The method I am sharing with you guys today is super simple and there is no prep work involved. You can make these when the craving hits and they’ll be ready in less than 10 minutes – it’s that easy. 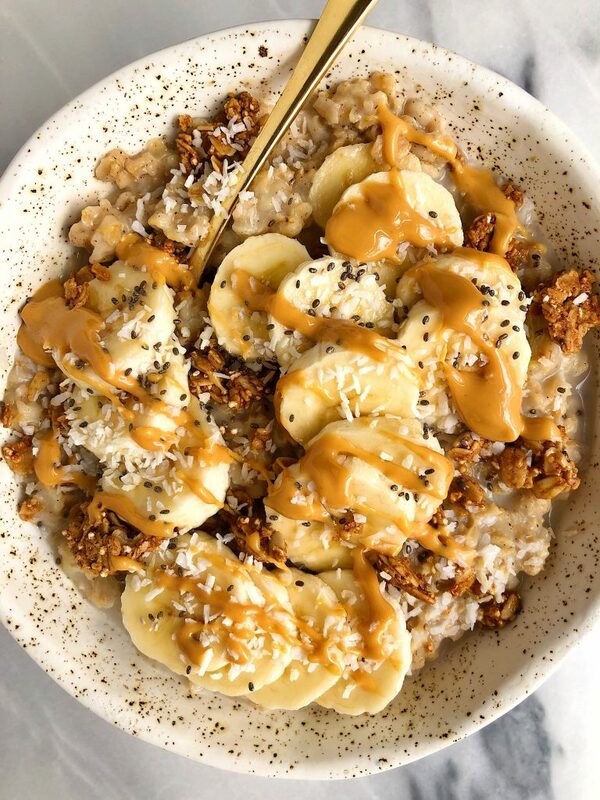 There are a few key ingredients that make the oatmeal in this recipe extra special. For starters I don’t use water to make them but instead use non-dairy milk. This makes them so much creamier and more flavorful. Water totally works if you don’t have a milk option but I do recommend trying it with milk when you can! You can use any kind you’d like. I love using almond, coconut, cashew, anything. 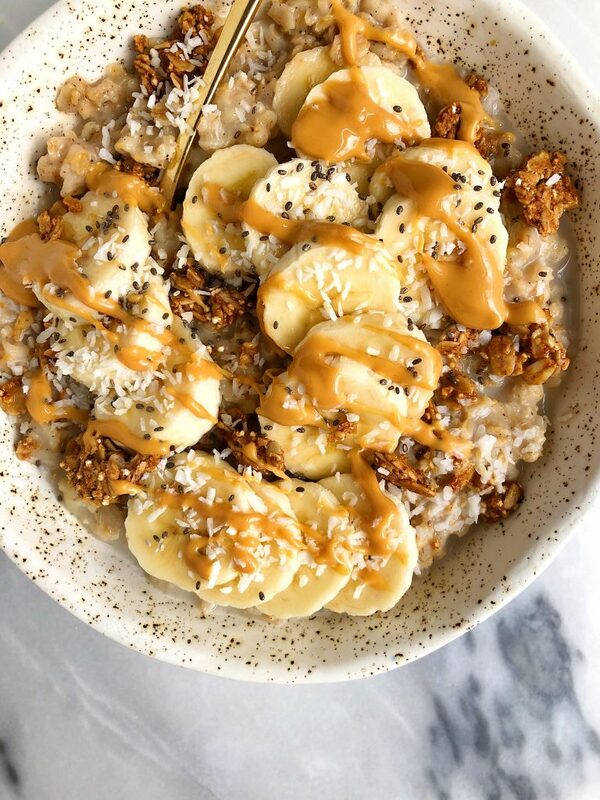 Once the oats are cooking for a few minutes you add in a little mashed banana (save the rest of the banana for topping!). This adds some extra sweetness to the oatmeal without adding any refined sugars. I also sprinkle in some cinnamon because I am addicted to cinnamon. Completely addicted! Now for the real twist of the recipe – we are adding Vital Protein’s Collagen Creamer. We usually chat about the collagen peptides on here as they’re my typical go to from Vital Proteins but lately I have been obsessed with the creamer. They are Whole30-approved with no added sugars or artificial anything. They have extra healthy fats from organic coconut milk and add the dreamiest flavor when you bake and cook with them. The vanilla is my personal favorite and it has 10grams of collagen peptides per serving (check out this blog post for why I use collagen peptides!). I hope you guys love this method and recipe as much as I do! 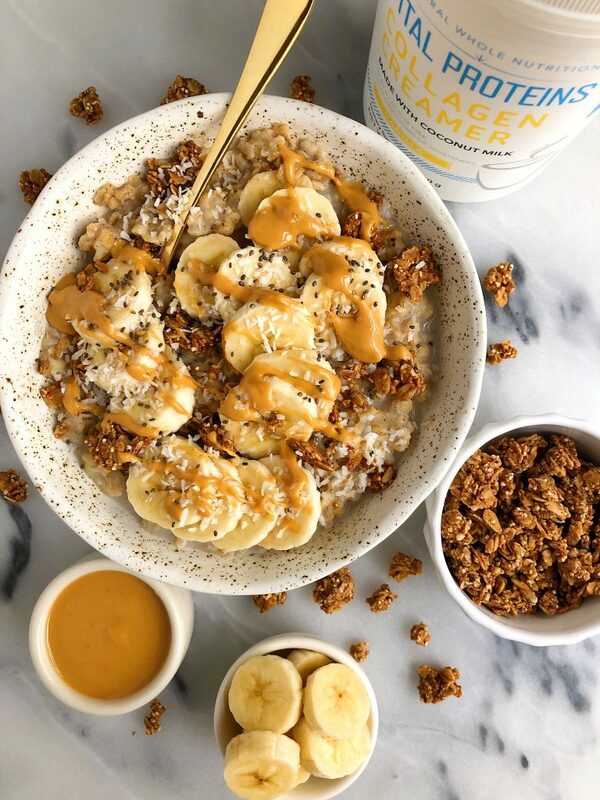 Perfect way to kick start the morning (and 2019) with something healthy, nourishing and delicious. Thank you Vital Proteins for sponsoring this post. It means so much to me to partner with brands I love and believe in!